Rory Gallagher, the powerhouse Irish guitarist who scores many votes as the quintessential British blooze conceptualizer, who successfully fuses black polyrhythms with Anglo rock dynamics, doesn't rest on his laurels. He likes to be up there where the action is, on stage, performing to demonstrative crowds who feed back the energy that flashes from Rory’s flying fingers and from the collective punch of his bassist, drummer and keyboard player. 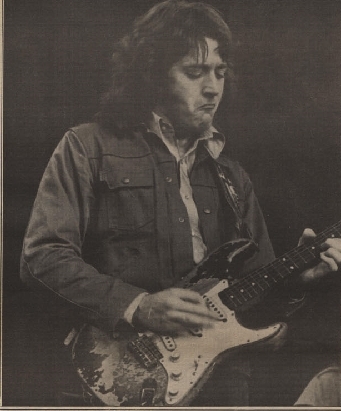 Rory Gallagher-Irish Tour ’74. A double-disc on Polydor was released on the last day of his six-week American concert tour, a day that also happened to conclude this year’s Schaefer Festival in New York’s Central Park, where Rory shared the bill with Aerosmith. Although he has been booked in recent weeks with ZZ Top, the J.Geils Band, and Sly Stone, Rory is a headliner in his own right—as he proved at Schaefer, where his fans gave him an ovation that must have been extremely uncomfortable to follow. Over dinner, Rory expressed enthusiasm for his upcoming three-week European tour, which the band will undertake after a much deserved week and a half rest in Ireland. They will play Germany, Belgium and Holland, with a one-night performance at the legendary Olympia Theatre in Paris. “And then we’ll come back here in November,” he said, without losing a breath. It is obvious that he is one musician who really likes being on the road. They played several cities in Japan in January, and enjoyed the experience which whetted their appetites for additional distant places. “I’d love to play behind the Iron Curtain, “admitted Rory, “and also in South America. They don’t let anything go in East Germany, concert-wise, and it is also difficult to get bookings in South America.” With all the ground he’s been covering, the peripatetic Gallagher may get there yet. Rory Gallagher is Celtic who has avoided traditional trappings. His music is rock Esperanto. It embraces many influences- rock, blues, and a smidgeon of folk. Mainly, what you see is what you get, Rory’s mind pictures, a long way from glitter, American gothic, Irish trad, or straight-on copycat blues.